We are thrilled to be introducing KEMETIC YOGA to our Digbeth dojo. 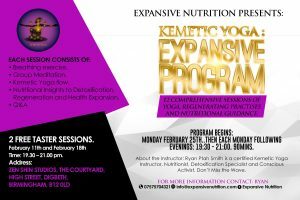 We proudly offer you 2 FREE SESSIONS of Kemetic Yoga during February (Monday 11th & 18th February 2019). See below for further information. Here at Zen-Shin we value and promote health and overall wellbeing. Yoga is a great practice we have personally experienced the benefits from and are now very excited to be facilitating Kemetic Yoga classes at our dojo. Kemetic Yoga is an a rapidly growing, ancient Egyptian form of yoga, that places primal emphasis on using the breath to achieve full body restoration and mindful discipline. The postures and sequences are inspired by the those practised in ancient Egypt and follow a sacred geometrical formation of postures and transitions compared to more conventional forms Yoga. We are holding a brand new 12 week course starting from 25th February 2019! But first… how about 2 FREE TASTER CLASSES to give you chance to get a taste of what’s to come?!! What to bring: A yoga mat if you have one, if not don’t worry, our matted flooring is great for yoga anyway. An extra layer to keep you warm during meditation. Don’t forget to bring an open mind and your positive vibes.